D11 is Triggera's splash cymbal from the Drumadeus series, made of steel and rubber. 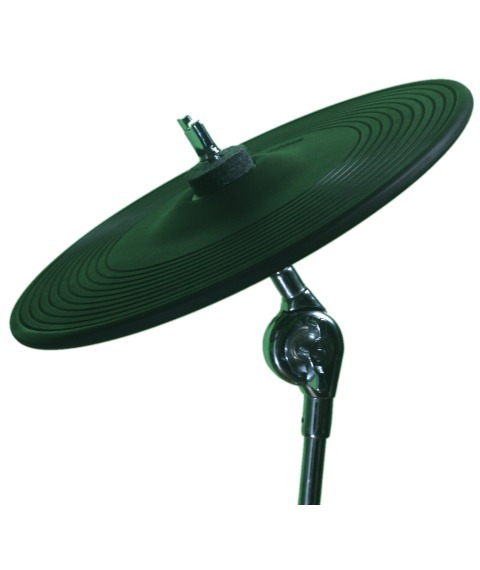 Unlike all-metal cymbals, it is extremely quiet, thanks to a special mixture of natural and synthetic rubber. And unlike plastic cymbals, it provides a natural feel with superb triggering and sensitivity. All in all, it gives the best of both worlds - low stick noise with great sensitivity and high dynamic range, along with "acoustic cymbal" natural feel, heaviness and swinging. This is a good looking cymbal! I like it a lot. I like the deep grooves in the rubber and the rubber itself seems sturdy and durable. The Triggera logo is nicely displayed just above the 'would be' bell area. The rubber surface covers all of the playing surface and looks like a nice design. It seems slightly flatter than some acoustic cymbals, but still has an acoustic cymbal shape to it. The cymbal 11 inches in diameter so its not a small splash cymbal. It's a lot bigger than my 2 Kit Toys splash cymbals. 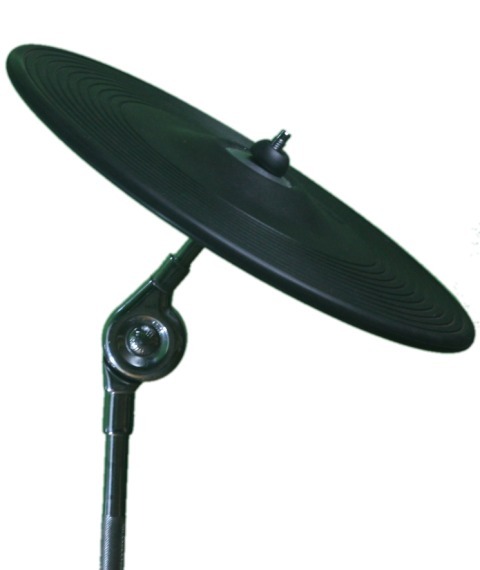 It could even be used as a crash cymbal in some cases depending on needs and space availability in and around your kit. This is a good thing as it gives the drummer more options on how to use the D11, splash or crash, it's up to you! The underside is made of a grey coloured steel and the trigger box is directly below the centre of the strike area. The 6.35mm jack is installed in the trigger box so it's all neat and tidy. There is no anti-rotation device so the cymbal will move like an acoustic cymbal upon striking it. This might bother some, but doesn't bother me. This is a heavy cymbal due to it's construction. Again this makes the cymbal versatile, crash or splash. However, this weight gives the cymbal a really solid feel and a sense that this will be a cymbal that stands up to quite a beating if you're a heavy hitter. As I said previously this is a solid feeling cymbal. It will certainly take a pounding whether you use it as a splash or crash. I had to slightly increase the sensitivity in my module but only by one or 2 to get the best triggering. I'm not a heavy hitter so many of you probably wont need to change the sensitivity at all. Obviously different modules and playing styles will need their modules tweaked to get the best triggering. It swings nicely when you strike it, but due to its weight it swings more than an acoustic splash cymbal equivalent. If you are looking for a small 7 or 8" splash then you might need to look elsewhere. This is a larger splash cymbal. Due to its weight and construction I think the cymbal is slightly noisier than say a Roland CY12 but I have no way of testing this other than using my own ears. It does seem to give off a 'doing' sound when you strike it. I think that's due to the steel disc vibrating. Still, its not overly loud in my opinion. When you consider it's price, it's good looks and the the fact that you can use it as a splash or crash this cymbal is a good buy. Its not a CY12 or yamaha PCY135, but its not pretending to be. 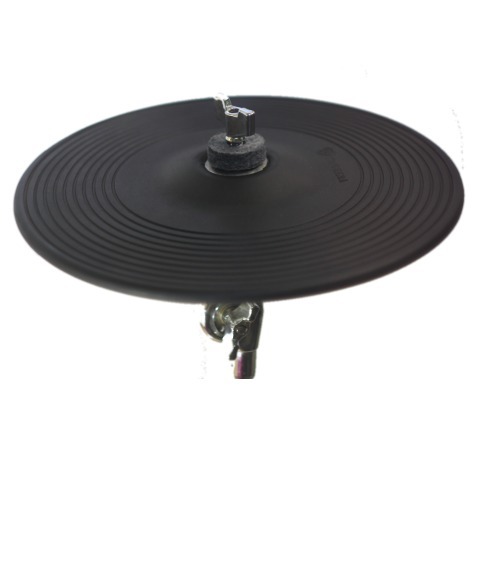 Its a smaller, single zone cymbal that will prove a handy addition to anyones kit. i think the Triggera range of cymbals will be far better looking than the Kit Toys range cymbals in my opinion and will trigger just as well, if not better. I have recieved my order, and I really like the cymbals! They feel very realistic and they respond very well to my module. (Roland TD-4) The size of the china cymbal is just amazing, the shape is great and the splash cymbal is equally amazing. Whilst researching for e-cymbals, one of my main criteria was that I was determined to buy from one of the smaller manufacturers rather than the big 2. The triggeras are metal and therefore have a good bit of weight and feel to them. Personally, I prefer the single zone of the D11 and D14 and these are such a good price you can afford to buy 2! Excellent customer service (tracking number provided) and a good all round experience. The cymbals are great, easily some of the best feeling out there. I currently use them with my Roland SPDS 30 Octapad. Really nice. I got a very portable kit with the kriggs and cymbals. Videos are coming soon. Be sure to come back. © 2019 All rights reserved. Triggera - Electronic cymbals and triggers for electronic drums.